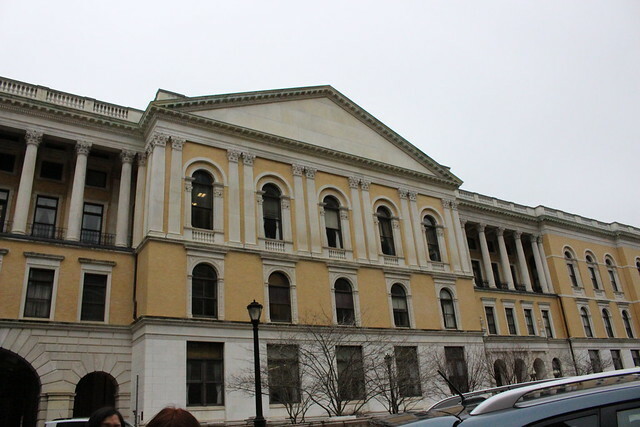 Did you know that each year the Massachusetts Library Association and Massachusetts School Library Association are co-sponsors of an event at the State House, Library Legislative Day? Representatives from libraries from all across the Commonwealth gather in the beautiful space under the Great Rotunda on Beacon Hill to showcase what is going on at their institutions. All of our state representatives and senators are invited to visit and have the chance to see for themselves all of the exciting initiatives libraries around the state undertake. On March 7th, Library Director Jennifer Harris, Branch Librarian Jennifer Jones, Technical Services Librarian Ann Clarke, and Dennis Crimmins, President of the Plymouth Public Library Corporation Board of Trustees, were proud to travel to Boston to share examples of Plymouth's many accomplishments this past year, including our Its a Mystery summer library program 2016 and our collaborative Poe-try program showcasing Edgar Allen Poe from last fall. Being visible and supporting libraries is more vital now than ever. Public libraries rely on government support at all levels--municipal, state, and federal--to deliver the very best information resources and programming they can to their communities. We need our patrons to be aware that the proposed federal budget eliminates funding for the Institute of Museum and Library Services (IMLS), an organization which administers federal support for libraries and museums at the state level. In fiscal year 2017, the Massachusetts Board of Library Commissioners received $3,220,591 funding from the IMLS. This funding goes to statewide resources including the Commonwealth Catalog, the Digital Commonwealth, the Commonwealth eBook Collections, the Consumer Portal, and the Statewide Summer Library Program. The many digitization projects we have undertaken in the last few years, enabling us to publish on-line our Town Annual Reports and High School Year Books, have been made possible through this funding, which is crucial for library services in the Commonwealth. There are several ways you can take action now to help preserve public libraries. An organization called EveryLibrary, a library political action committee, has put together a petition to preserve funding for the IMLS, as well as the NEA, the NEH, and PBS. This petition takes about one minute to fill out and automatically sends an email to your US Representative asking them to support these agencies. Find the petition here. The American Library Association also has an action center which walks you through the steps to contact our Congressional representatives asking them to commit to keeping federal library funding. Please help us keep libraries going!